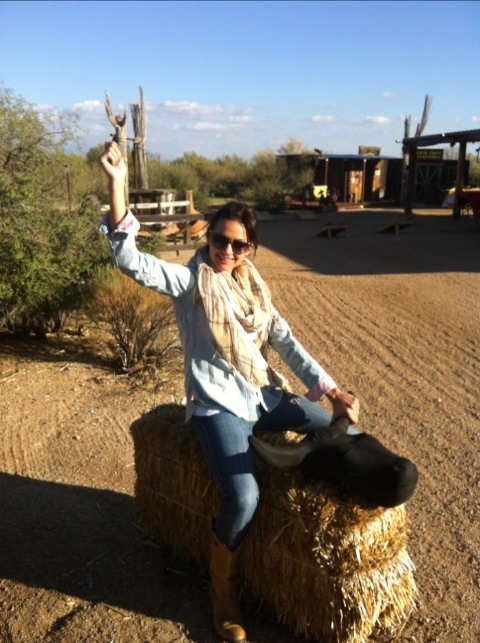 Not that this is an uncommon sight (speaking purely of wearing double denim), but here I am in Cave Creek, about to embark on a two-hour horseback ride through the stunning, tranquil desert. I’m seen here in some old Chip & Pepper skinny jeans, denim button down by Arnold Zimberg and vintage boots I picked up for $20 at American Superior Vintage on Melrose. Can’t recall who made the scarf, but I got it at one of my favorite spots to shop, Milk in LA. This entry was posted on Saturday, November 26th, 2011 at 8:25 am	and tagged with American Superior Vintage, Arizona, Arnold Zimberg, Canadian Tuxedo, Cave Creek, Chip & Pepper, cowboy, cowgirl, Denim, double denim, Fashion, Gretchen Schneider, horseback riding, Jeans, Melrose, milk, Phoenix, Wild Wild West and posted in In The Wild. You can follow any responses to this entry through the RSS 2.0 feed.